Make It returns to Vancouver this weekend featuring close to 100 designers from across Canada including Vintage Love from Toronto, Belua from Edmonton and Vancouver's own Hank & Cheef. 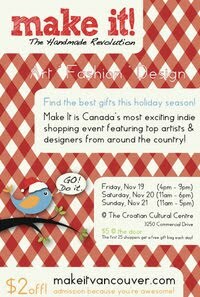 Make it promises to be "a super awesome shopping experience that combines a craft show with a party!" With tons of handmade goodies to choose from including clothing, accessories, art, jewelry, baby items; expect to find something for everyone on your list this holiday season. Friday, November 19th, 2010 - 4:00 p.m. to 9:00 p.m.
Saturday, November 20th, 2010 - 11:00 a.m. to 6:00 p.m.
Sunday, November 21st, 2010 - 11:00 a.m. to 5:00 p.m.
$5.00 at the door, or click here for a $2.00 off. For more information, please visit makeitvancouver.com. We are excited to have the opportunity to host a giveaway for 10 pairs of tickets to Make it! Leave a comment or email to info at gotcraft com telling us what your favourite craft is. Please make sure to leave your name and contact number or email address. Contest closes on Thursday, November 18th, 2010 at 5:00 p.m. (PST). Winners will be chosen randomly. Fav craft: making friendship bracelets! Recycling old Christmas cards into new awesome ones for friends and family. It's sort of like regifting but on an ok way. I love knitting, lately I've been making a lot of little teddy bears as all my friends are pregnant! I love quilting! And cross-stitching occasionally .... I'd love to win tickets to Make It! Thank you for the giveaway! Hey! Thanks so much for entering. All of your names will be at the front desk at Make it. Enjoy the show!